Last year the nominal head of Facebook, Mark Zuckerberg admitted in a blog post that try as they might, Facebook had still not managed to prevent people having honest conversations on his platform. The widely criticised and apparatchik-abused 'Community Standards' had not stopped the spread of ideas that its progressive Californian origins took great exception to. In fact, worse, it had annoyingly actually made Facebook's users more sophisticated in the way that they created their posts making it even harder for these would-be censors to find a fig leaf to justify their clamping down. Complementing this process, many mainstream politicians were also feeling chill winds of populist rejection as the political climate moved unfavourably. Theresa May's Conservatives had frittered away the Brexit goodwill dividend and their PR people watched in dread the steady rise of populist news sites, many of them turbo-charged by social media, which were managing to reach more people than mainstream media outlets. Facebook had already been called onto the carpet of various Parliaments and told to restrict content that was buffeting these liberal politicians and send those ghastly types back into their cellars. And Zuckerberg himself had taken his booster seat to Congress to prop himself up, while he plead his case. In Britain state agencies had also been knocking at the door of various publishers intimidating them into desisting. More formally, in the UK, our country's regulatory reaction to all this had begun to visibly bubble up from various sources, including under Damian Collins, the Chairman of the Digital, Culture, Media and Sport Committee (Parliamentary report, 2018; Global Compact on Censorship; various initiatives including the "White Paper On Online Harms") and also under grillings from the appalling termagant Yvette Cooper, Chairman of the Home Affairs Committee, who had taken over from her colleague Vaz, when he was found to be ordering cocaine for his close rentboy friends. The continent-wide alarm at the Yellow Vest phenomenon and wider insolent public mockery of politicians had only increased these political anxieties and the old Russian standby had proved a wonderful pretext to package a reactive response under the repetitively paraded banners of stopping 'fake news' and 'preserving democracy'. Those on the Left who had argued that the Brexit Leave campaign had lied and these lies had been chiefly responsible for stealing victory from their clammy hands, quickly fell in line with this proposed censorship of their political enemies, many of them in the media and public service sectors. At TBG Towers, we did not have to wait too long to see the green shoots of this more aggressive 'content governance' policy. In a previous post we outlined how our parent Facebook page was removed for the flimsiest of excuses (#) and without appeal - for the use of a lion logo in Britain!! (pictured) It seemed clear the real justification was the numbers of people the page was engaging on a weekly basis. Here * is its ghost. 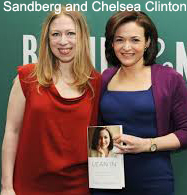 Although the term is debatedly a Facebook pay-to-play marketing scam - 'reach' back then was put in the multi-millions. Thereafter our posts quickly started to be removed with time-out penalties if they showed anyone from a protected group in a negative light, or particularly if they showed protected groups being beastly to Europeans on the basis of their ethnic identity. A post criticising refugees attacking an old woman in Denmark would be 'bullying'. A post of a black South African telling a white South African beggar he would not help him was 'hate speech'. Posts that sought to outline negative content would be penalised as if they had actually approved of those actions. In short, it severely constrained the ability of us and more generally people on the right to outline visceral content examples which were implicitly critical of mass immigration trends. Take this African calling for the colonisation of Europe # from France - which is not permitted to show and earned our admin a 30 day ban. We also saw this tendency it in a lesser way around many other counter-progressive trends, such as content which was critical of the transgender fraud or the misnamed 'Pride' movement. Suddenly this year we noticed some odd behaviour on the page as Zuck's new deep freeze policy kicked in. Posts that received high traffic would suddenly be found behind 'error' messages as their Bombay coders tried to get up to speed with the covert censorship, interaction on the page plummeted, non-admin page followers reported to us they never saw our content in their daily feeds and had to remember to visit us, comments that were made under the imprimatur of our page were hidden or classified as 'spam' and inevitably the multi-million page weekly reach soon dropped to just under 100,000 and thousands of weekly new followers dropped back to just a hundred or so. Then even those who found their way to us and wanted to follow the page in their feeds were suddenly counselled to think again for the first time ever. "Are you really sure?" nudged a grinning Facebook. 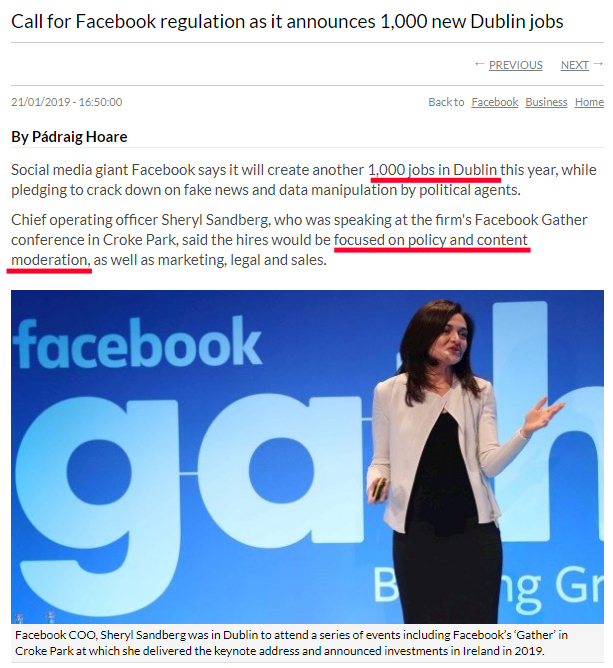 The week of writing this, (January 2019) the Facebook CEO Sheryl Sandberg has announced 1,000 new jobs at Facebook's European censorship headquarters in Dublin to police European content and make it more progressive-friendly. The timing of this shortly before the electoral campaigns for the EU Parliamentary elections where populist parties are predicted to dramatically increase their numbers is no coincidence. And Facebook have proudly announced this Cali-Cartel activism around elections, including in India, to decide what content is acceptable, alongside their carefully selected third-parties. Facebook had good teachers for this, including rehiring official ex-Stasi agents now selling their services from foundations they founded whose employees firebomb their elected political rivals, at least when they're not busily campaigning to turn children into spies. They say you can know a lot about someone by looking at who their friends are. When you zoom out and take a wider look at these tendencies alongside the frequently reported experiences of many 'alt-light' people being thrown off other platforms or having their content limited and these penalties being delivered in a coordinated manner across many commercially distinct corporate platforms (Paypal, Patreon, Amazon, YouTube, Facebook, Twitter, Visa, Mastercard etc) plus infrastructural attacks on key rivals to these platforms such as Gab.ai ( a 'free speech' platform) it seems pretty clear that these Silicon Stasi are now at the forefront of a shared policy goal to reduce the visibility of dissident populist voices, manage and recalibrate democratic consent and try to offset the wobble of the left-liberal cultural order. Interesting times! For all the discussion of a democratic deficit by populism or Russia or other bogeys du jour, consider then how these declared social media trends play out in an election season or across the political and social media culture that fundamentally informs it. Rather than looking under our virtual beds for Russian SVR agents manipulating our thought processes, these Silicon Stasi are in the position of limiting public access on a global basis to content that presents an existential danger to their left-liberal consensus. Buzzwords such as inclusivity or polarisation/radicalisation are simply ideological constructs which mean 'our worldview preference'. This is particularly the case when content focuses upon the many negative trends within multi-ethnic societies. One such post (which we will link to below) was a snipped version of a Hopkins visit to Bradford which outlined negative territorial behaviour towards remaining British families as suburbs there changed demographically - another 30 day ban and a page deletion (later reinstated on appeal). 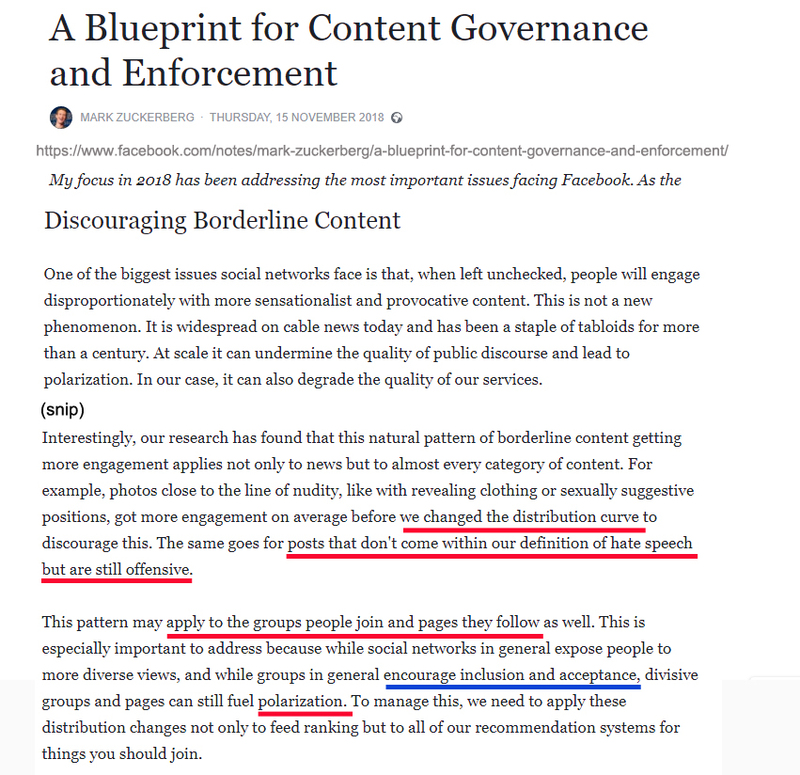 When this behaviour by social media giants reduces the visibility of dissenting voices, or suppresses examples of real social harm, when it decreases the awareness of populist groups who give a political voice to widely held concerns - which I hope I have shown that they unquestionably do - then it seems incontrovertible that the social media gatekeepers are manipulating democratic consent simply by removing content they think is unhelpful to their 'team' - hence the creation of an online 'parallel universe' in the article's title. The cumulative weight of these manipulative practices far outweighs that of a few hundred pounds spent on Facebook adverts by a shadowy Russian entity in its shabby Moscow office. This latter bogeyman has for some time been used as a surrogate excuse to actually police the content that you view without in the majority of cases any awareness that it's being done. Facebook may have exaggerated its video views by 900% or its users by up to 50% to potential advertisers, but it is still the social media market leader and therefore a critical information platform and daily source of 'news' for its users. 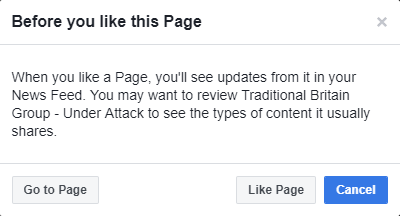 Looking forwards, we have therefore decided that we will post content from our pages here that has fallen under the Facebook ban hammer (if you have egregious examples yourself, please send it to us with a screenshot) and you'll be able to evaluate for yourself whether it's fair comment. Often times it will be sensitive, even controversial content, but we believe such items are a vital part of the debate or political culture to allow people to more properly gauge the societies we live in, where we are being led and to drive wider awareness to allow members of our society to reflect upon this. We'll link the page for it soon enough. In the meantime all of our social media strategies on the populist/traditionalist/conservative/right on such platforms needs to be ever responsive to these developing restrictions, continuing to reach out to those members of the British public who blithely use their services and also to lead people to less restricted and blinkered alternatives. It's the responsibility of everyone who uses social media to at least familiarise yourself with alternatives such as Gab, MeWe, Minds and others. Content sharing alliances, may well also be one way forward.